You can now source case and Pulse attachments from repositories, which provides a complete solution for attachment management. In addition, unlike other external sourcing solutions, repositories do not require OAuth 2.0 authentication, so that you can connect to repositories that use non-interactive authentication. 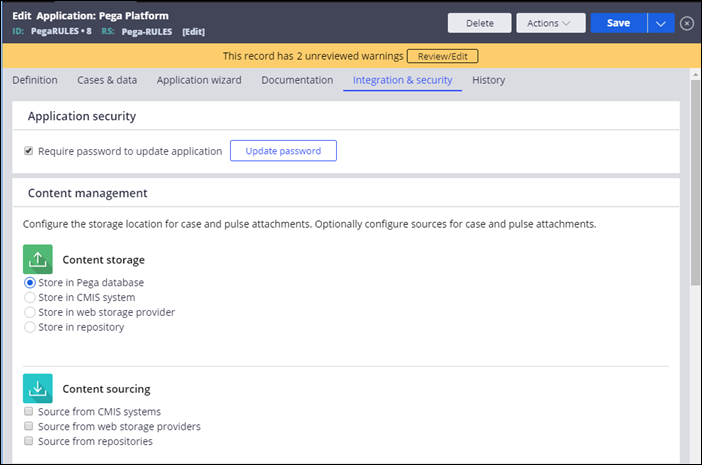 The ability to source attachments from repositories allows Pega Cloud customers to attach files from the Pega Cloud File Storage repository without using repository APIs. The following figure shows the content management options for storing and sourcing content for an application. For more information, see Configuring external sourcing options for attachments.